Fireworks Fridays is a series of captivating fireworks displays and late-night specials. The series kicks off on June 1 with the Summer Sizzle, a pyrotechnic show synchronized to today’s Top 40 hits. Beginning June 8 and continuing throughout the summer series, Cinema in the Sky will pay tribute to well-known film scores including Star Wars, Grease, The Greatest Showman and Guardians of the Galaxy. On Independence Day, a 4th of July parade, live music, and a special patriotic themed display of fireworks will be in full swing. Following each fireworks show, Boardwalk guests can enjoy a variety of late-night specials such as live music in the Events Plaza until 11 pm, rides open until midnight, free souvenir cup refills after 9:30 pm, and additional retail savings. Saltgrass Steak House, Lighthouse Buffet, Red Sushi, and Kemah Aquarium will all have happy hour specials for visiting night owls. 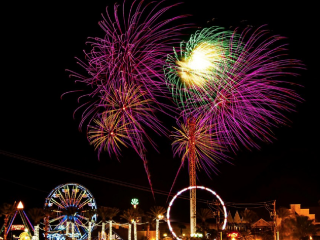 For the full events schedule, visit Kemahboardwalk.com/featuring/firework-fridays.